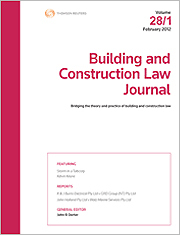 In the context of a range of available models competing with each other as alternatives to litigation for resolving commercial disputes in the construction industry – driven in part by court-led demand for expedition in litigation – Leigh Duthie in the Building and Construction Law Journal (Vol 32 No 6) considers the future of expert determination as one alternative dispute resolution model. Expert determination is a largely private process in which parties to a contract agree to refer disputes or issues to an independent expert for determination. They are commonly used in the construction law area to determine such issues as: the entitlement of parties to variations, time extensions, delay claims, and the costs of outstanding works prior to practical completion of a construction project. Being “a quick and cost-effective” method of resolving commercial disputes accounts for the continuing popularity of using expert determinations in the construction industry, argues Duthie. However, it is the very advantages that expert determinations promise for the resolution of disputes that, contradictorily, cause some parties to try avoid implementing expert determination clauses in contracts. “Parties may be understandably concerned at the prospect of a final and binding decision of potentially multi-million dollar disputes being made informally and by a non-legal arbiter,” says Duthie. the expert failed to provide sufficient reasons for the determination. Notwithstanding these considerations, there would appear to be much to recommend expert determinations for the resolution of commercial disputes within the construction industry. Duthie notes their particular effectiveness when applied to single, fact-based issues and in resolving technical disputes. He concludes that, like Peter Pan, expert determination does not need to “grow up” and change, because of its inherent utility as a means of alternative dispute resolution – its informality, speed, and low cost. His proviso is, however, that expert determination clauses in construction contracts be prepared well: that “at the point of drafting and negotiating” there is clear consideration and articulation of “the purpose, process, and effect, of a determination”. You may also be interested in Australasian Dispute Resolution Journal, our key resource for staying up to date in the area of alternative dispute resolution.